San Deigo Discount Headstones and Grave Markers Serving San Diego ,California | "Telling the Story Between the Dates"
Let our In House Artist Design free of charge a Flat Marker, Serp Top Slant or a Pillow Headstone online. If you need a premium custom flat granite headstone in San Diego California at an affordable price, our design-your-own headstone product is an ideal choice. Available as a single or companion and Flat, Slant or Pillow styles. Each style is available in several sizes and 14 colors. All headstones will be professionally designed and carved to incorporate the exact text and graphics that you select. Let us help to tell the story of your loved one. You complete the ordering process online, in the privacy of your home or business. 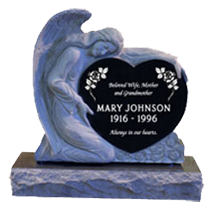 Upon completion of your headstone order,your memorial headstone will be shipped or delivered. We deliver to most San Diego cemeteries. Work directly with one of our design consultants to personalize the memorial for your loved one today.